Need help installing Joomla! 3.x? For all Joomla! 3.x installation issues please use this forum. I'm trying to install on my Synology 418play. I installed the package in the Package Center along with Apache 2.2 and MariaDB 10 (PHP 5.6 and 7.0 already installed). I then run Joomla and it opens in a my W10 client pc as expected, I'm using Chrome. I get through all of the installation steps (including the removal of the txt file in the installation directory) and proceed to install with the default English Sample Data. The installation page then shows some greyed out text but never completes. I have seen that changing the default PHP parameters for max_execution_time and memory_limit can solve the problem so I have changed them (for both versions of PHP) via the Web Station app on the NAS but I don't know if that affects the Joomla install? The Joomla version is 3.8.4-0165, the NAS is working well and runs the latest version of DSM (6.2-23739). Last edited by toivo on Fri Jul 13, 2018 3:49 pm, edited 1 time in total. I was worried after reading the installation requirements that MySQL was not supported after version 5, so I checked my MariaDB with phpMyAdmin and the database has been created so that doesn't appear to be the issue. Seems to be stuck on "Creating configuration File" or perhaps on the next step? Woot! It has finished! Free at last! Free at last! Now I can spend the next x number of months trying to learn Joomla. How did you proceed to finish the installation ? Do you know what was the issue at the end ? 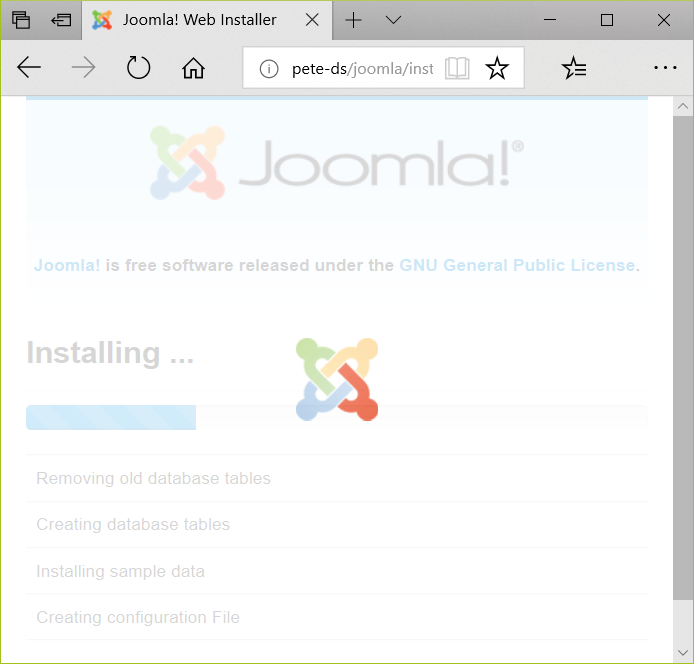 Have the same issue :-( try to install joomla but it returns after a while to the last install screen, it creates the database but it didnt finish the installation. @Pepsi92, you appear to be using a version of Joomla yet to be released, a database that may or may not be supported, and obsolete PHP version. You need to install Joomla 3.9.2 and be using at least PHP 7.2 by now. Also as Leo suggests, use the Forum Post Assistant report to help you post and provide the tech detail about your site. I would suggest though, in future, please post your own separate question (whether or not it's the same issue or not). It confuses the issue, over who is helping whom when everyone puts their finger in the pie, so to speak. Separate questions allows for individual focus on helping the poster of the question. Millennium Falcon - it's the ship that made the Kessel run in less than 12 parsecs! The fastest hunk of junk in the galaxy.